The average monthly household income of the richest 1% of Indians is Rs66,627 and that of the richest 10% is Rs35,605, according to the latest data from a nationally representative survey, the Household Survey on India’s Citizen Environment & Consumer Economy (ICE 360° survey) conducted in 2016. Given that these income estimates are based on self-reported data, it is likely that they understate true incomes, especially in the case of top earners. One way to adjust for the under-reporting is to look at the extent of discrepancy between the aggregate household disposable income estimated by the survey and the one reported in the national accounts, and adjusting for that discrepancy by blowing up the income estimates from the survey. Such an exercise suggests that the average monthly household income of the top 1% could be as high as Rs1.17 lakh while that of the top decile could be Rs62,574. 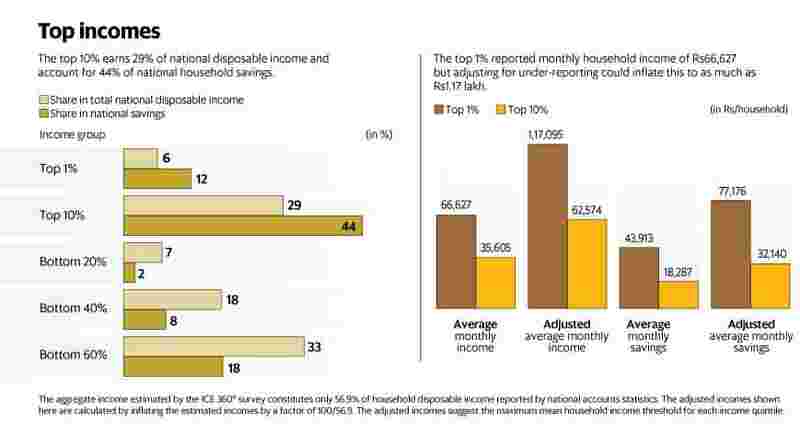 The survey shows that the share of the top 1% in aggregate household disposable income is 6%. The share of the top 10% in the aggregate income pie is 29%, only a little less than what households belonging to the bottom 60% of India’s income pyramid earn collectively. The top percentile accounts for 12% of aggregate household savings, higher than the share of the bottom 40%. The top decile accounts for 44% of aggregate household savings, more than double the share of the bottom 60% of Indians, shows the survey. These savings figures refer to the surplus income of households, part of which tends to be used for non-financial investments. The aggregate household savings of Indians estimated by the survey is 34%. The distribution of savings is more skewed than that of income in India, shows the ICE 360° survey. The distribution of wealth in the country may be even more skewed than that of savings. As a recent Mint report based on a Credit Suisse study pointed out, the richest 1% own 58.4% of the country’s wealth. Unsurprisingly, the proportion of top earners investing in equities and bonds, and purchasing insurance, is much higher than the all-India average. Seventy-two per cent of the top percentile and 62% of the top decile use capital market instruments (including insurance) against an all-India average of 35%, shows the ICE 360° survey. A singular trait of top earners in India is vehicle ownership, suggests the survey data. Ninety-eight per cent of households belonging to the top 1% own either a two-wheeler or a car. 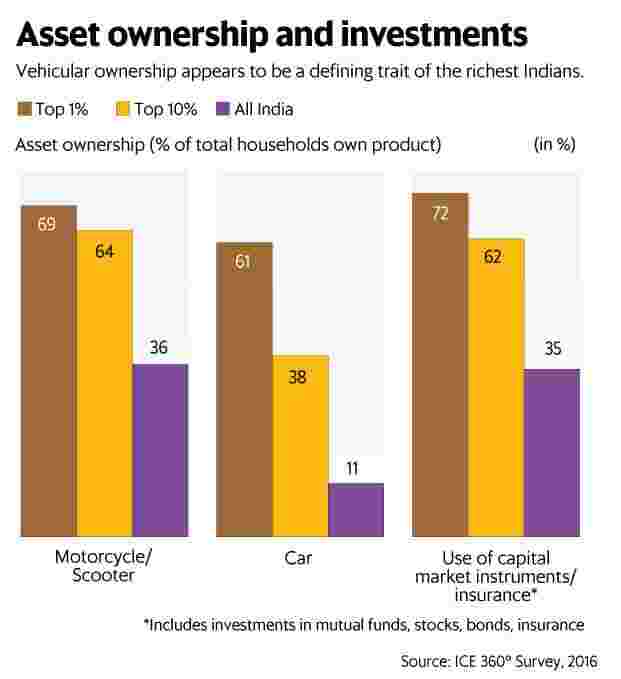 Similarly, 82% of households belonging to the top 10% own either a two-wheeler or a car. Sixty-one per cent of the top 1% and 38% of the top 10% own a car, according to the survey. The urban sample of the survey is comparable to that of the NSSO survey. While NSSO surveyed 101,651 households of which 41,968 (41.3%) were urban households, the ICE 360° survey covered 61,000 households of which 36,000 (59%) were urban households. The rural sample of the ICE 360° survey is less than half of the NSSO sample. Nonetheless, all the estimates of each region have been derived by adjusting for the respective population of those regions. A notable feature of this survey is that it is representative at the level of economic clusters. Urban India has been divided into four clusters: metros (population more than 5 million), boom towns (2.5- 5 million), niche cities (1-2.5 million) and other urban towns (less than 1 million). Based on a district development index, rural India has been sub-divided into three different clusters: “developed rural", “emerging rural" and “underdeveloped rural". The first category includes districts such as Bhatinda and Kangra. The second category includes districts such as Latur and Kamrup, while the last category includes districts such as Kalahandi and Bastar. Roughly a quarter of both the top decile and the top percentile live in metros, shows the survey. But the top percentile is not entirely concentrated in the cities. 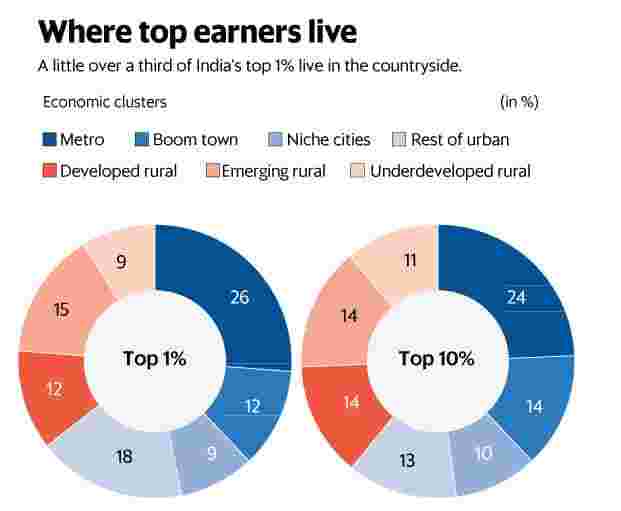 Thirty-six per cent of the households belonging to the top percentile live in rural India. Top earners are likely to be better-educated compared to others. 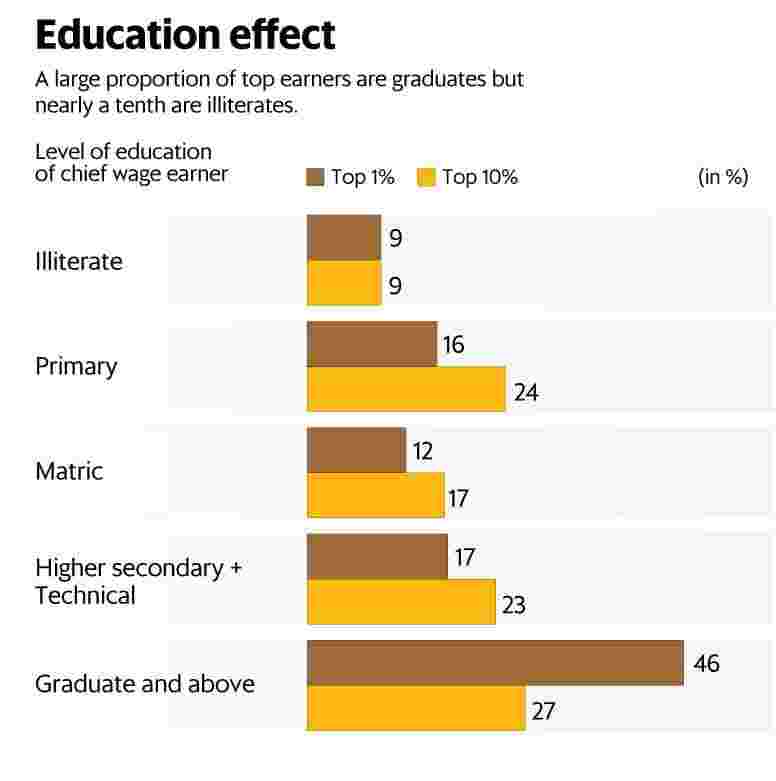 Fortysix per cent of breadwinners in the top percentile have at least a graduate degree. Across all Indian households, the proportion of households with graduate breadwinners is only 8.3%, shows the survey. The comparative figure for the top decile is 27%. 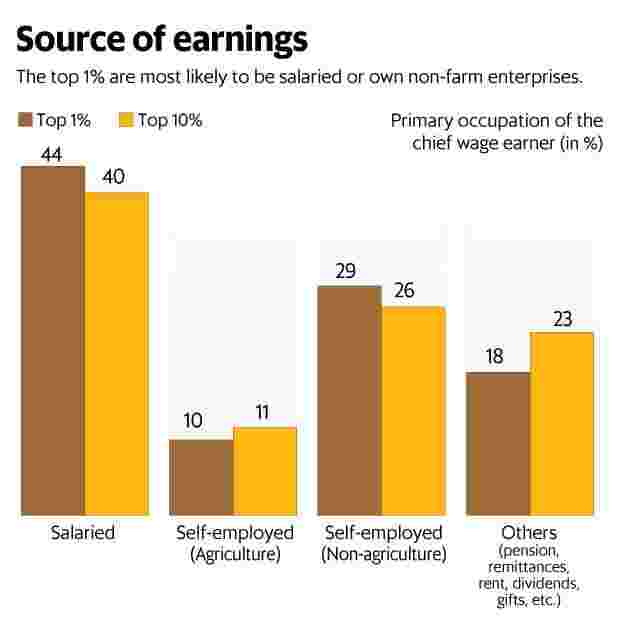 Top earners are most likely to be salaried, or owners of non-farm enterprises, suggest the survey—44% of the top percentile and 40% of the top decile are salaried employees, while 29% of the top percentile and 26% of the top decile own non-farm businesses. The next part will look at how Indians live, and how much they pay for their homes.